New era for women's basketball in the U.S. Derided, mocked and supposedly needing life resuscitation, reports of the Women’s Basketball Association’s demise have been greatly exaggerated. Far from it - the WBNA's is marketing its upcoming season with the slogan "Expect Great." It's a campaign that reflects the WBNA's growing confidence despite some of the jokes about the league: "Expect Great...Seats to Be Available." Founded in 1996, all too often people have associated the WBNA with the "Family Guy" clip in which they show a game, and then cut to a sole fan in the stands rooting on his team. The reality is very different. There was a large and vocal crowd at Game One of the Finals between the Minnesota Lynx and the Atlanta Dream, which was played at Target Center (the Lynx's home court, which they share with the Minnesota Timberwolves of the NBA). The play certainly contradicted stereotypes that surround the WBNA. 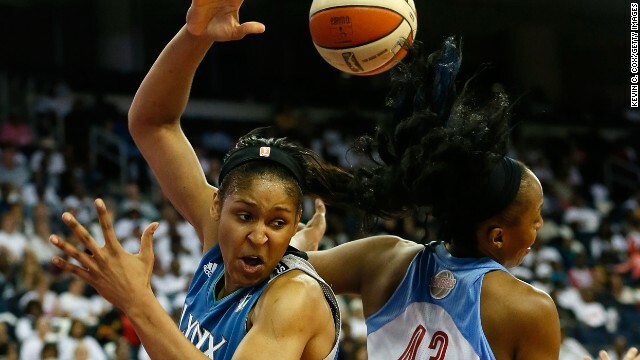 Maya Moore was the best player on the court as she led the Lynx to a convincing victory, while Lindsay Whalen, the Lynx’s point guard, shone in orchestrating the offense and distributing the ball. The fact that the height differentials between the players aren't as drastic as the men's game allows for a different style of play, especially in the passing aspect. As an avid fan of basketball who appreciates the nuances of the sport, it almost gives the play an old school feel. And how refreshing that there was little to no ego on the court. No Kobe Bryant pleading to the refs to call a foul every time he misses a shot; no Joakim Noah screaming at the crowd every time he makes an And-1 as if he just won a battle to the death in the Coliseum in Rome. If to be humble in moments of triumph is a true showing of character then all of the players on both the Lynx and the Dream exuded that in spades. After sweeping the Atlanta Dream 3-0 to win their second WNBA title in three Finals appearances it appears that they could be a dynasty in the making. The WNBA is not the first women’s professional basketball league. The first attempt dates back to 1978, and was called the WBL, the Women’s Professional Basketball League. There were several other incarnations of a professional women’s basketball league, but none made it very far off the ground. Compare this history to women’s professional football, which was re-launched this year after being dismantled in 2011 after a two-year stint and arguably begs the question is there more of a demand for women’s basketball in the U.S.? But what about the fans of the women's game? WNBA viewing figures for this season went up 19% on NBATV from last season, and increased 28% on ESPN2, while for the first time the lottery draft was televised on prime time. "We saw an incredible increase in individual ticket sales which I think is a sign of growth among new and casual fans," WBNA president Laurel Richie told reporters. There are 12 teams in the WNBA, a relatively small number compared to other professional leagues in the U.S. Originally when league play started in 1997, all 12 were owned by the NBA, but now six are under independent ownership - the Los Angeles Sparks, Connecticut Sun, Chicago Sky, Tulsa Shock, Seattle Storm, and the Atlanta Dream – an encouraging sign for the future. A number of international players have found success in the WNBA. Lauren Jackson of Australia, Ticha Penicheiro of Portugal, and Svetlana Abrosimova of Russia, have all won at least one WNBA championship, while Brazil, Canada, France, Spain and Italy, have also been represented in the league. The salaries of teams and players are capped, and no one can be paid over $101,500 a year. This is insignificant when compared to most other professional athletes who make at least five times that, but some WBNA teams are also beginning to advertise sponsors on their uniforms, in the way all English Premier League teams do. This is not common practice in the U.S. and it will be interesting to see if it sets a trend. "On the partnership front, State Farm joined us this year and Proctor & Gamble came back… We have seen across the league teams in both cases, our sponsorship revenue is up this year." said Richie. It's impossible to predict what direction the WBNA will take in the future, but the signs are increasingly encouraging. I notice you didn't speak to one important question: is the league still bleeding money? Wait. I have the answer: Yes. Until this thing at least begins to break even, you can't reasonably talk about taking it seriously.